The reverses for the BJP in the Hindi heartland threw wide open the 2019 Lok Sabha elections which until a few months ago appeared to be in the grip of Prime Minister Narendra Modi's party. 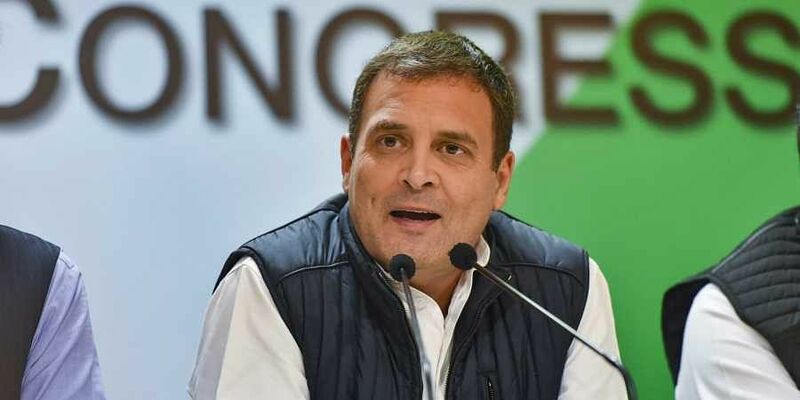 NEW DELHI: A resurgent Congress Tuesday made significant gains in the Assembly elections, dealing a body blow to the BJP in Chhattisgarh and Rajasthan and was locked in a cliffhanger in Madhya Pradesh. The Assembly polls held for five states also saw the Telangana Rashtra Samithi (TRS) recording a landslide win for a second consecutive term and the Mizo National Front (MNF) scripting a spectacular victory dislodging the Congress in its last bastion in the Northeast to return to power after 10 years. Prime Minister Narendra Modi got a massive mandate but refused to listen to "heartbeat of the country", Gandhi told reporters. With Congress set to form governments in Chhattisgarh and Rajasthan and locked in a close fight in Madhya Pradesh, Gandhi said the selection of chief ministers in the three states will be done "smoothly". "We have defeated the BJP in Madhya Pradesh, Rajasthan and Chhattisgarh. There will be no issue over (selection of) chief minister. It will be done smoothly." Modi congratulated the Congress, the TRS and the MNF for their victories and said the BJP accepts people's mandate with humility. "Victory and defeat are an integral part of life. Today's results will further our resolve to serve people and work even harder for the development of India," he said. Finance Minister Arun Jaitley said the results were certainly not as expected and asserted the poll outcome was an opportunity to pause and analyse. In a shock result, the Congress ended Chief Minister Raman Singh's uninterrupted 15-year rule in Chhattisgarh. It won 22 and was leading in 46 in the 90-member House while the BJP was relegated to a distant second spot winning 3 and ahead in 13, according to latest trends available with the Election Commission. Raman Singh submitted his resignation to Governor Anandiben Patel and said he accepts responsibility for BJP's poor showing. Rajasthan Chief Minister Vasundhara Raje too handed over her resignation to Governor Kalyan Singh in Jaipur. The Congress was heading towards majority in the desert state, winning 87 seats and leading in another 12 out of 199 seats. The BJP had 72 seats in its kitty and was ahead in one. As voting trends and results slowly trickled, the Congress, which had just 58 seats in the outgoing Assembly in Madhya Pradesh, was set to cross the 100 mark in a House of 230. The Congress was winning or leading in 113 seats while for the BJP this was 110. According to Election Commission data, both the BJP and the Congress had around 41.2 per cent votes each. Three-time Chief Minister Shivraj Singh Chouhan, who was battling anti-incumbency, won the Budhni seat but a dozen ministers were trailing behind Congress candidates. Senior Congress leader Jyotiraditya Scindia said the trends reflected people's desire for a change in Madhya Pradesh while state Congress chief Kamal Nath exuded confidence they will form the government in the state. "Trends show Congress marching ahead to victory in Rajasthan, MP and Chhattisgarh. We are confident the trend will continue across the country," Congress leader Sachin Pilot said in Jaipur. In Chhattisgarh, the Janata Congress Chhattisgarh (J) of former chief minister Ajit Jogi was ahead in five seats while the CPI and the Gondwana Gantantra Party and the CPI (M) were leading in one seat each. The trends in the desert state of Rajasthan, showed the Congress is inching towards the magic mark of 100, winning 22 and leading in 78. The outcome reflected the 20-year "revolving door" trend of voters in choosing the BJP and the Congress alternately. The ruling BJP won 15 and leading in 58 of the 199 seats which went to polls. The BJP and the Congress had 163 and 21 seats in the outgoing House. Independents won three and were leading in nine. Rajasthan has a 200-member assembly but polling in Alwar's Ramgarh constituency was postponed following the death of the BSP candidate there. The Congress will hold its legislature party meeting in Jaipur to decide on who will be the chief minister. Former chief minister Ashok Gehlot and Pilot are frontrunners for the top post. The TRS is set to form its second successive government in Telangana where it won a simple majority and is heading for a landslide with its candidates clinching 79 seats and leading in 9 in the 119-member House in a resounding endorsement of its chief K Chandrasekhar Rao's popularity. Rao himself won by a margin of over 51,000 votes from his Gajwel seat, trouncing Congress's V Pratap Reddy. Rao's son K T Rama Rao and nephew T Harish Rao, both ministers in his caretaker government, also won. The Congress clinched 18 seats and is leading in one. Its ally TDP won two seats. Rao told reporters that Telangana proved to be a non-Congress, non-BJP state and that the TRS will play a crucial role in national politics. Rao dissolved the Assembly in September, eight months ahead of schedule, in a political gamble that paid off handsomely. The Mizo National Front(MNF) got a simple majority bagging 26 of the 40 seats at stake dislodging the Congress which bagged five.